Birch Aquarium at Scripps is taking gradual steps toward sustainable business practices. 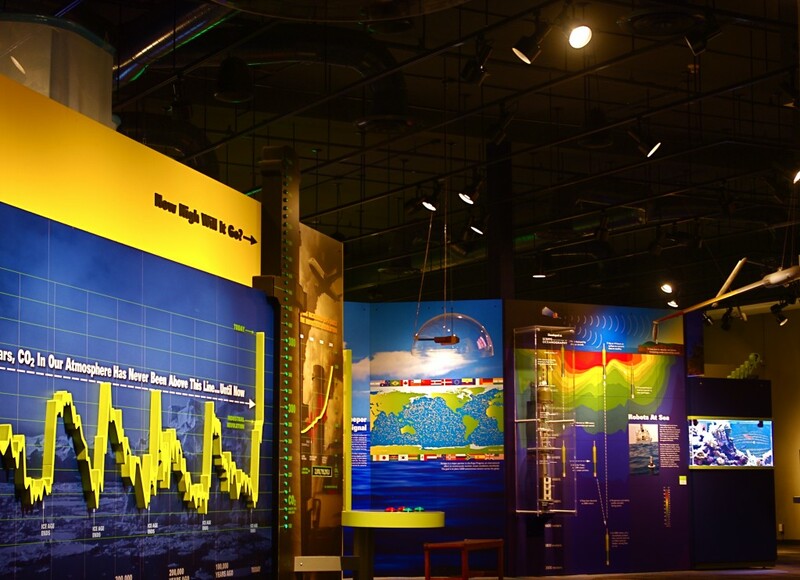 Our most recent success involved upgrading 150 exhibit lights to energy-efficient light-emitting diode (LED) bulbs. Find out why this facility improvement means so much to us. Exhibit carpenter Kevin Stephens has been darting back and forth between Birch Aquarium’s exhibit workshop and his desk for the past five minutes. Each time Kevin ducks into his office, he reemerges cradling an armful of empty lightbulb boxes and a couple of bulbs he hasn’t shown me yet. We begin to adorn an acrylic-topped workbench with flood-lights and spotlights, lining the bulbs up to compare new and old designs. A selection of current and past lightbulbs used by Birch Aquarium. 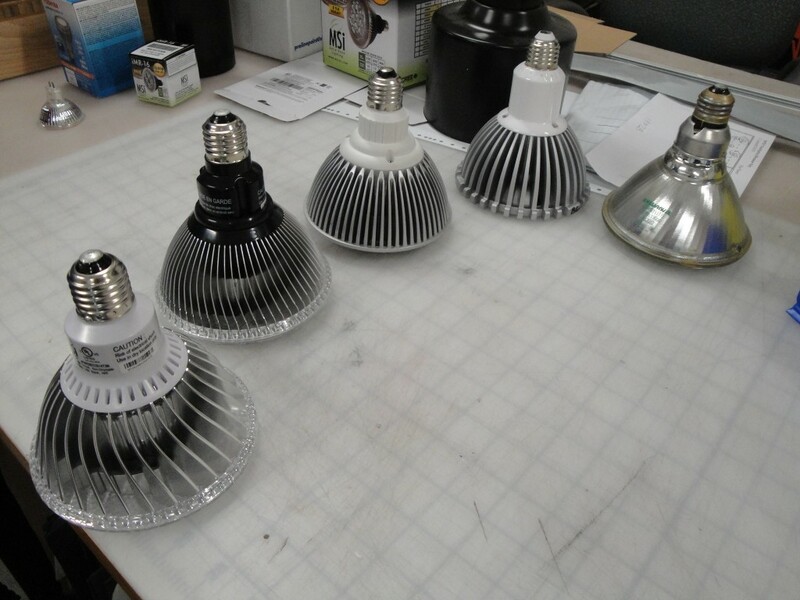 The newest LED bulb (far left) weighs less and is more energy efficient than the halogen bulb (far right). 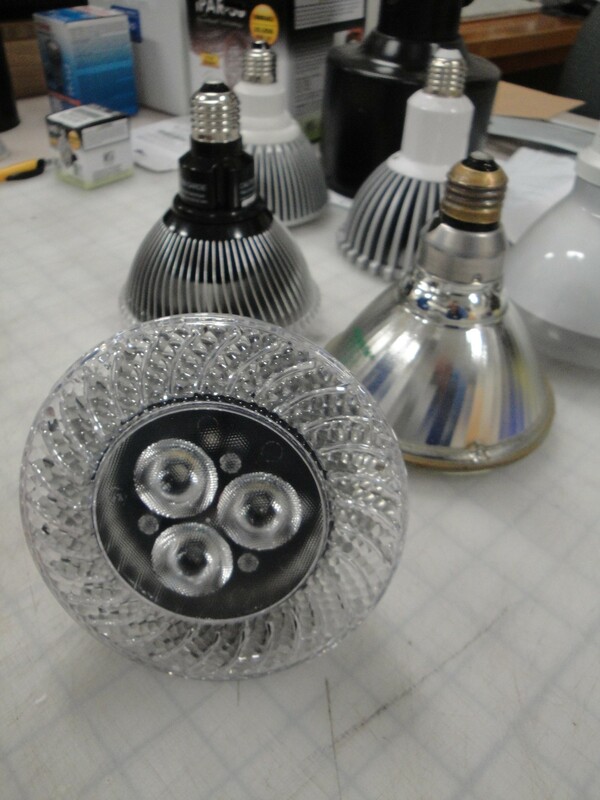 The three bulbs in the center are different generation models of LEDs (newer, left; older, right). Upgrading to LED lighting has been a gradual process for Birch Aquarium. Over the past five years, the aquarium has switched to increasingly energy-efficient lightbulbs. Energy-sucking 90-watt incandescent bulbs were first replaced with 75-watt halogens, then 23-watt compact fluorescents (CFLs). However, Birch Aquarium exhibit developers were disappointed by the gray light that the CFLs produced and hoped that LED technology would soon catch up with their artistic ambitions. They didn’t have to wait long. “We got excited when we learned that UC San Diego had acquired some money that could help improve our exhibits,” Kevin says. He hands me an example of one type of LED bulb which now illuminates the aquarium’s exhibit galleries. Exhibit carpenter Kevin Stephens holds up one of the LED light bulbs now in Birch Aquarium exhibit galleries. Don’t let the stylish look of this LED fool you—it is a remarkable advance in energy-efficiency. By rotating a powerband ring, users can select from three power level settings (10, 14, or 16 watts) to choose the amount of light that suits their needs. Weighing less than a pound, this LED model is used in 100 of Birch Aquarium’s 150 light fixtures. The remaining 50 fixtures in the Hall of Fishes use an LED model that consumes even less energy—a mere five watts! These LEDs are cutting Birch Aquarium’s energy use by 35,000 kilowatt-hours per year. That’s enough electrical energy to power 4.2 homes for a year! Interior lighting creates an aesthetic experience for Birch Aquarium visitors. Lighting effects are used to create a mood, soften transitions between displays, or highlight special objects. Birch Aquarium exhibit developers take pride that new LED lights are providing an enhanced experience for guests. Each LED bulb has three donut-shaped diodes, which disperse light where our staff needs it. “I am impressed with the improved optics,” Kevin observes. “Each diode is like a prism.” The LEDs produce bright white tones, which better match outdoor light conditions. This brings out subtleties in exhibit photographs and gives other graphics a crisper look. The bright white tones of the new LED lights bring out the vibrancy and details of Birch Aquarium’s displays. Courtesy of Katchen Weaver, EcoGreen Lighting. The holes in the lens of this LED lightbulb help to draw air through it and keep it cool. Also, did you notice the three donut-shaped diodes? The curved ribs on the back of this LED lightbulb help to dissipate heat. 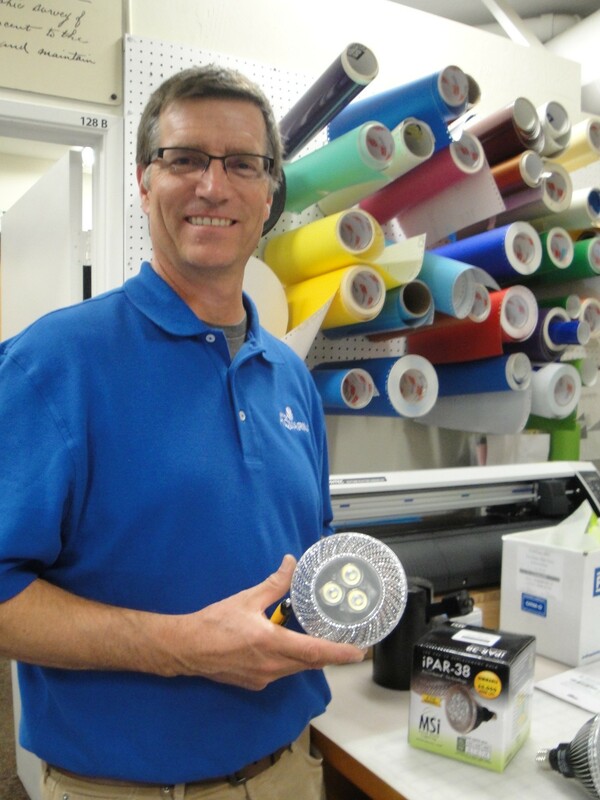 Using LEDs is not just energy smart, it’s business smart. More like a no-brainer. Kevin sits down at his desk and thumbs through a stack of manila file folders to find a copy of Birch Aquarium’s recent energy-use assessment. He hands me a sheet of paper with key information highlighted in black boxes at the bottom. I begin reading: Average electrical savings: 77.5%. Energy savings per year: $6,000. Total savings over 5 years: $41,000; over 10 years: $94,000. “People are often surprised by the amount of energy savings from simply changing how existing systems operate,” says Anna Levitt, UC San Diego’s assistant energy manager. “The energy savings are huge!” Anna would know. Through campus-wide lighting retrofits, her team has helped UC San Diego save an astounding $6.8 million in the past three years (2009-2012). 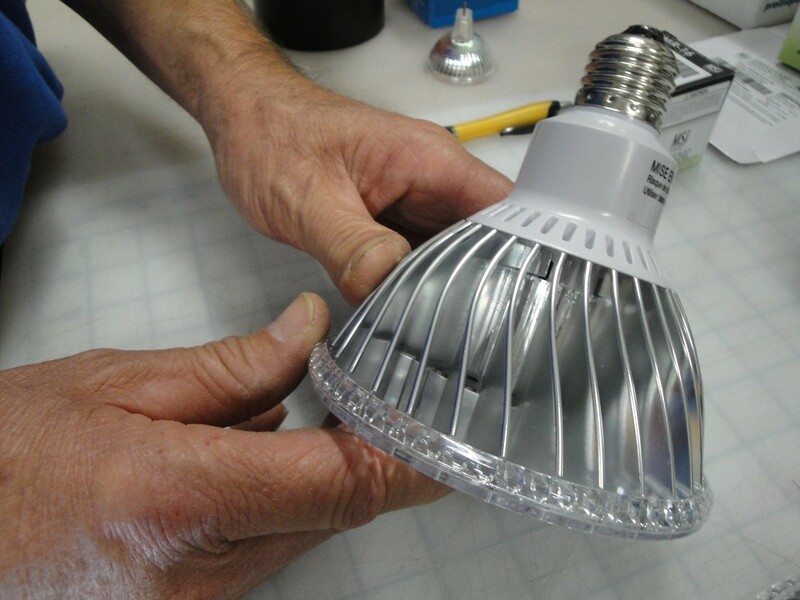 “Because it is a new technology, [LED bulbs] cost more to buy up front. But you have to look at it as a long-term investment,” Anna advises. LED lighting enhances the beauty of museum galleries. Exhibit staff no longer need to scramble up and down ladders every five to seven months to change out “hot potato bulbs.” Compared to other types of bulbs, LEDs waste little energy as heat—they light homes and offices, not heat them. Businesses save money by reducing their energy costs. Another important benefit is that LEDs don’t contain mercury—a drawback of CFLs, which need to be disposed of as toxic waste. And, close to the heart of Birch Aquarium, energy-efficient lightbulbs reduce the amount of fossil fuels burned to generate electricity, helping to mitigate climate change and increasingly acidic oceans. Curbing carbon dioxide and other harmful emissions also reduces air and water pollution. People sometimes assume “sustainability means sacrifice,” but that’s a mistake. Energy-efficient business practices are a win-win-win strategy, yielding profits while benefiting people and the planet. Of course, using technology to relieve the pressure we exert on natural systems is only part of the solution. But watching the creative strides that people are making in this direction is thrilling. To see scientists and engineers working through ideas, eliminating what doesn’t work and testing what might… What simple yet elegant innovations will make our lives better? The lives of other species better? And how many of those innovations will come dressed, like a lightbulb with cooling lens holes, in understated yet ingenious fashion? Pogue, David. “New reasons to change light bulbs.” New York Times, 20 March 2013. Assessment reflects 6% per year cost of energy increase and bulb replacement. Birch Aquarium’s lighting upgrade will prevent 26 metric tons of carbon dioxide from being emitted each year. Often referred to as the triple bottom line, a term coined by John Elkington in 1994. Analysis of this and other sustainable development models helps people to consider the dynamics among economics, environment, and society.